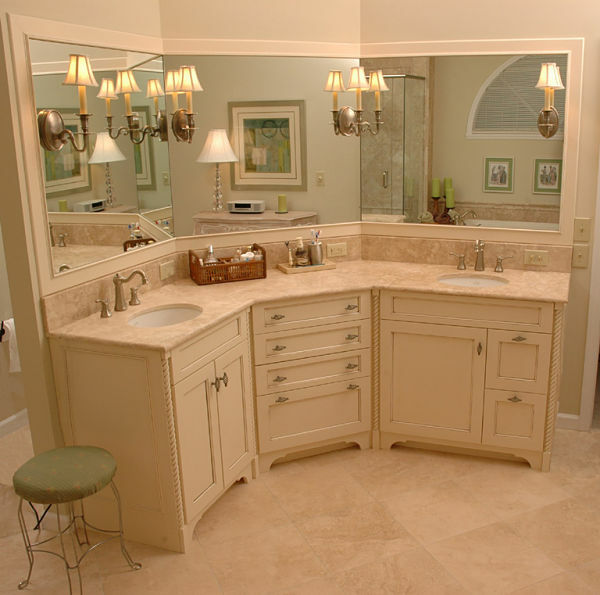 Bathrooms are generally smaller spaces that require careful planning to create functional storage. In addition to towels, storage is needed for cosmetics, toiletries, grooming supplies, hairdryers, curlers, medicines, tissues, cleaning supplies, dirty laundry and a waste basket. Organized storage is important to control clutter and optimize the space in these rooms. If space is an issue, you may want to consider cabinets with a depth of 16-to-18 inches instead of the standard 21 inches. When selecting cabinets for a bathroom, think of the room the way you would a kitchen. To accommodate small items, the minimum depth of a cabinet should be at least 9 inches. Cabinets are generally 18-to-60 inches wide and come in 3-inch increments. If you choose a cabinet-mounted sink, the base cabinet will be used to hide plumbing. Often this space is difficult to access and under-utilized. Consider what you would want to store there and think about adding cabinet accessories such as pull-out trays to make this area work for you. Also, consider a recessed base cabinet toe-kick to allow for more floor space. Recessed cabinets. Cabinets built into the wall between the wall studs are one of the most efficient options for creating storage in a small room and conserving floor space. Wall-mounted cabinets. 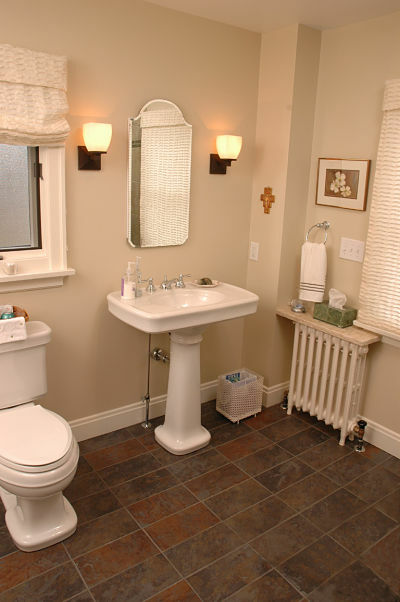 Pedestal sinks are often recommended for bathrooms because they occupy a minimum of floor space and add style. One of the problems with pedestal sinks is that they lack storage. If storage options are limited in your bathroom, consider a wall-mounted cabinet for the sink with doors and interior shelves for storage that will keep the floor space underneath clear. Narrow cabinetry. Wall cabinets are available in widths beginning at 12 inches. A narrow cabinet placed on or near a vanity may be the perfect solution for storing toiletries and cosmetics. Custom cabinets. 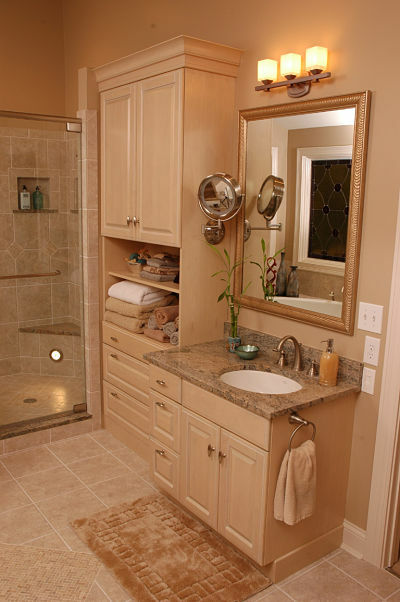 Bathrooms can have small niches and corners that could be used for storage if only you could find a cabinet to fit. Custom cabinetry can be made to fill these spaces. Pullout trays. Use pullout trays with bathroom cabinets to help stay organized. If your design includes a base cabinet, pullout trays can be installed around plumbing and will enable you to easily access contents. Tilt-out or pullout hamper for laundry. Why occupy limited floor with a hamper if you don’t have to? If your room has the space a tilt-out hamper can be installed on a base cabinet door or add a pullout with a basket to collect towels and clothes for the wash. Kitchen accessories. Pull down drawers, corner carousels, pullout or hidden storage for a waste basket, drawer organizers, towel racks, cup hooks can all be used for your storage needs in a bathroom. 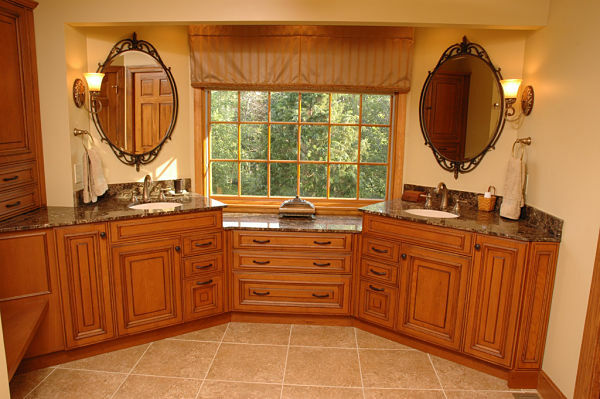 When selecting a vanity determine which height is best suited for your use. The National Kitchen and Bath Association recommends vanity heights ranging from 32 inches (table height) to 43 inches (bar height). A 36-inch vanity is equivalent to the standard height of a kitchen counter. Consider a vanity that will store your essentials. Vanity storage can include drawers, the counter, a base cabinet, a lower open shelf or narrow cabinets placed on or above the counter on each side of the sink. Also consider placing an open shelf just above the sink backsplash for storing items you want at-hand such as a toothbrush or liquid soap. Open shelving is very versatile and can be mounted over and around fixtures to create storage. If you plan to use a pedestal sink or lack the space for wall cabinets, shelves can be installed for small items and towels. Open shelves can be mounted at several levels and can be installed over a toilet if your space is small. Use baskets and jars to keep items organized. 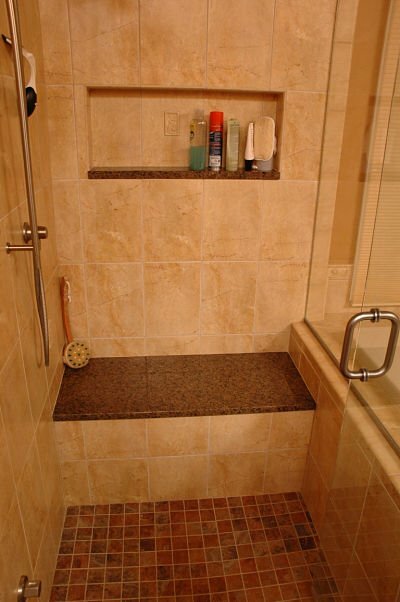 When planning a shower, consider niches and a shower bench to hold shampoo, hair conditioner and soaps. Medicine cabinets are making a big comeback in bath design. They can be mounted or recessed into a wall and provide considerable storage space. A standard medicine cabinet is about 15½ inches wide and 30 inches tall. The cabinet depth is generally 4-to-5 inches. Two or three can be mounted to extend storage space. There are many models, shapes and sizes on the market to accommodate both your storage needs and decor. Custom cabinetry is also an option for unique spaces or to create a special look. Think about hanging a towel rack on the back of a door or in the wall space behind for towels. Heated towel bars are a great innovation and provide both a storage solution and comfort in a bathroom.